A root beer float is one of my favorite summertime treats. The combination of cold and sweet ice cream with fizzy, spicy root beer is a winner every time. 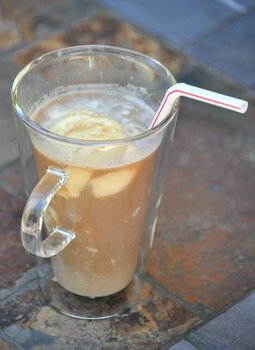 Coffee drinks usually take on a blended form in the summer, but the “float” concept works extremely well with coffee and is right up there with the root beer version for me. This drink starts with two scoops of good quality vanilla ice cream in a nice, big glass. The better your ice cream, the better your drink is going to be (in other words, save the lower fat stuff for another time). Fill the glass about halfway up with cold milk, then fill it up to the top with chilled black, coffee. Give everything a little stir with a straw and then enjoy. The ice cream adds all the sweetness that your coffee will need and will still keep the drink very refreshing. You don’t need to add any milk and could use all coffee if you really wanted to, but adding that milk highlights the creaminess of the ice cream wonderfully. This could be a dessert drink, but it is something that I usually prefer to enjoy on a lazy weekend afternoon when I’m sitting outside enjoying the summer weather. I always prefer to use vanilla ice cream (it’s a classic for a float! ), but chocolate actually works just as well in this type of drink. Place 2 scoops of ice cream in a large glass or root beer mug. Fill approximately halfway up with cold milk, then fill to the top with chilled coffee.